Imaginative. Intriguing. Ingenius. Three words that we would use to describe the creative world of Josh Nall (@casualtyofcool). Transcending reality and entering into a world of pure and vivid fantasy, Josh brings to life the things that we find only in dreams. And he does so using Mextures in some of the most fantastical ways - pushing the boundaries of color schemes and tones. We have taken great pleasure in following Josh's work and we think you will too. 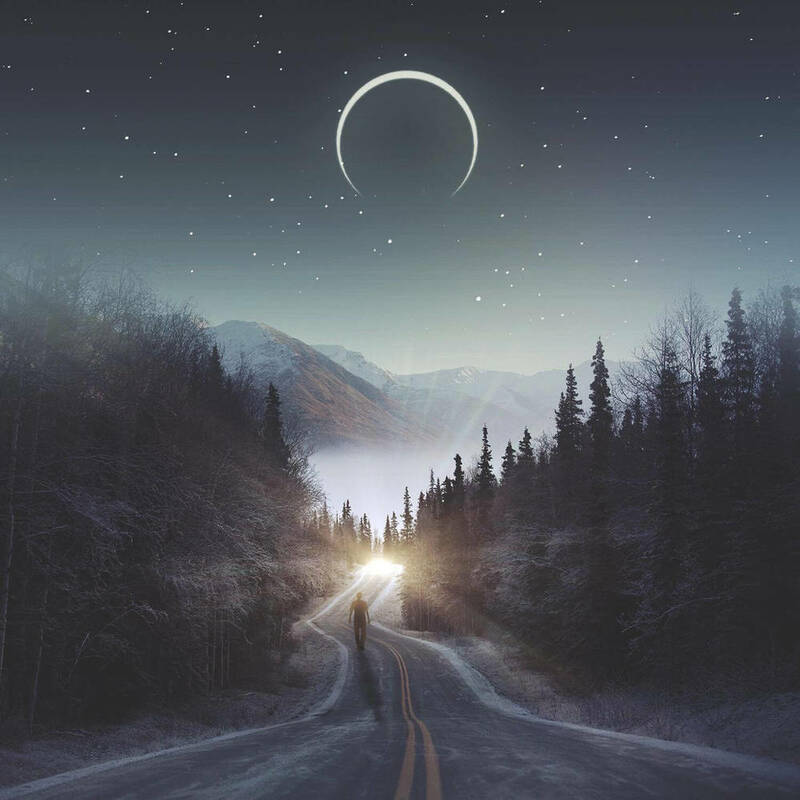 That's why we spent the time to chat with him about his creations and his use of Mextures in the most recent addition to our Featured Artists series. My name is Josh Nall and I currently reside in North Carolina. As much as I'd love to say that I'm a full time artist and designer, sadly I am not. I'm a manager at Costco. While I love what I do, I love graphic design more. I do graphic design on the side for fun (sometimes paid if I'm approached for work). I love my family too. My wife and daughter are my world and always push me to better myself. I'd love to be able to make the switch to a full time artist. In a world full of people with crazy amounts of talent it takes knowing the right people and finding the right people to market yourself. How did you first fall in love with graphic design? I've always been interested in graphic design. I took a few graphic classes in high school and that started it. It wasn't until I discovered mobile editing that I really fell in love with it. I randomly found Sam Woods' Instagram and was in awe of his feed knowing it was all done with his phone. Looking into it further I discovered RSA Graphics and was even more blown away. From there I started looking up what apps people were using and in doing so discovered Mextures. I pretty much started from there. Those two apps were what I started with until I wanted to take it up a notch with masking so I think I found Superimpose and went from there. I guess as I progressed and gained followers (I started with 100 - mainly friends) I would have people asking for images that they could use as wallpapers and then was eventually approached for album art. I was blown away that someone liked my work enough to want it as album art. I ended up remaking the art in Photoshop (to give them the highest quality) and from there I really started using Photoshop every day for hours just (re)learning as much as I could. Now, most of my edits are created with 50 percent mobile apps and 50 percent Photoshop. Mextures is used on every edit though. I swear that app is magic. It can turn the dullest images into a work of art. did instagram help to encourage your design work? Yes. For the most part. Originally, I only used Instagram to post personal pictures - nothing related to art at all. Now I only post art. Every now and then something that isn't art makes its way in, but it would never be like a selfie or anything like that. I've met so many people through the Instagram art world. It's crazy. Some of those people I talk to almost daily. It's pretty cool how there is such a strong community. Everyone respects each other and inspires each other. It's really cool to be a part of that. What does your editing process usually look like as a graphic artist? Typically when I start an edit I have an idea of the final outcome (I guess that's stating the obvious). Getting there is the tricky part. Sometimes the hardest part is finding the right images. The more elaborate the piece is, the longer it takes. I've easily spent 1-2 hours searching for all of the right images to make some of my ideas come to life. Some pieces may only contain two separate images blended together while others might have six or seven. As frustrating as it can be, in the end it's always rewarding to see an idea come to life. Once you have your concept and you find your images, how do you go about blending and editing and such? Normally I will either edit on my phone or Photoshop. There are some amazing apps available for the iPhone. If there is a specific app I want to use in an edit I just use my phone for the entire edit. Or I'll start something in Photoshop and then finish it off on my phone with an app such as Glitché - something that's really hard to replicate. The last step of my editing process is always Mextures to polish the piece off. When you get to that last step and begin to use Mextures, how do you typically use it? When I first started using Mextures it took me forever to come up with different formulas. There are so many possibilities. But after using the app as much as I have it doesn't take me long to find something I really like. Being familiar with what effect certain textures create really helps. Sometimes I will use the same formula but tweak it and then save it as something new. I have over one-hundred formulas saved. A little something for everything now. Would you be willing to share some of your formulas with the Mextures crowd? Broken - VGCCCTL - Made up of mainly Vintage Gradient and Landscape Enhance overlays and one Grunge overlay. This formula smooths everything out and brings a nice brightness boost to the center of your photo. It also adds a slight vignette effect. Lights - TKLJQMB - Contrary to its title, this formula darkens everything. Bam - FLVKKEN - Comprised of three overlays that work very well together. It has a similar effect as Broken and gives a nice depth to each image I use it on. Oska - CAMGPUP - Named after Gabe (@oskadesign), this very simple formula relies on the Blood Orange overlay and adds a nice glow to the center of your image. This is one of my most used formulas. Most my formulas are named after the image they were created for. Sometimes it has something directly connected to the image (like "Lights"), sometimes they are named after the title of the image or just the feeling I had when I was creating the images. Oska was named after @oskadeisgn because the original edit was inspired by him. I really feel like I can't express enough how much I love Mextures. It adds so much to the final image. Without it, most of my edits would look like garbage. Well, that might be extreme. But it does completely transform them. It is definitely the icing on the cake. It's a must-have app and it can turn the dullest images into jaw-dropping glory. And I'm not just saying that! Do you have a before and after example of how you’ve used Mextures on one of your pieces? Here's a short video that shows the entire creation process of one of my pieces! What have you found inspires you to create more than anything else? I would say music more than anything else. The feelings that music evokes can inspire me. It could be the lyrics giving off different emotions - things I feel I can relate to. Sometimes I'll create an image representing what I think the lyrics mean. Who are the people who have most shaped and inspired your work? When I first started I would say @samwoodsiv. His was the first "surrealist" Instagram account I'd ever seen. I'm not even sure how I found his feed now. The second person was @fresh_fvck. He had a process video of how he would use masks and everything, because before that I would just Mextures with a simple blending app or something and that would be it. When I found out about masking apps like Superimpose it changed everything for me. Do yourself a favor and check out more of Josh’s work on Instagram!